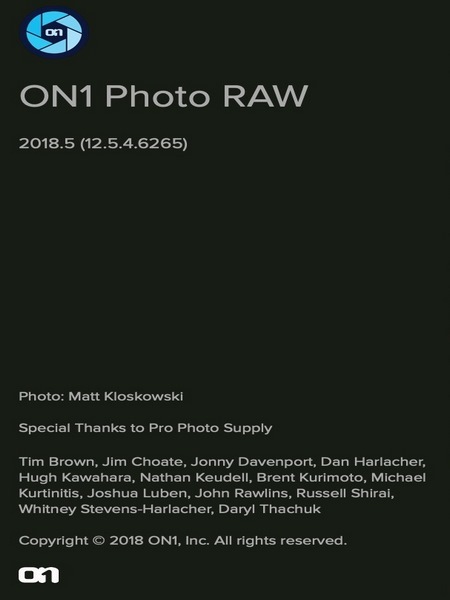 ON1 Photo RAW 2018.5 includes the essential tools and features every photographer needs in their workflow. Our super fast, non-destructive, and state-of-the-art processing engine gives you an ultra smooth and efficient editing experience. ON1 Photo RAW is focused on allowing you to get the most out of every photo. Photographers now have a tool with fast photo management, hundreds of customizable photo effects, fast and beautiful HDR, panos, masking and selection tools, layers, and much moreâin one app. This is a free update to ON1 Photo RAW 2018. It contains several bug fixes and and support for additional cameras and lenses. It is recommended for all users. Additional Camera Support â Added support for the Fujifilm XF10, Fujifilm X-T3, Nikon P1000, Nikon Z 7, Panasonic LX100 II, Leica M10-P, Nikon Z 6, Nikon D3500, Sony XH99, Pentax K-1 II, Fujfillm GFX 50R, Leica C-Lux. Additional Lens Profiles â Added lens profiles for: Canon EF35mm f/1.4L II USM (750), Chinon Auto Chinon 35mm f/2.8, KMZ Helios-40 85mm f/1.5, Nikon 200-500mm F5.6 174, Panasonic LEICA DG 8-18/F2.8-4.0, Panasonic LEICA DG NOCTICRON 42.5/F1.2, Pentax Pentax SMC Takumar 50mm f/1.4, Sigma Sigma 17-50mm f/2.8 EX DC HSM, Sony FE 24-105mm F4 G OSS, Sony FE 50mm F1.8, Tamron 14-150mm F/3.5-5.8 DiIII C001, Tamron SP 24-70mm F/2.8 Di VC USD G2 (A032), Voigtl?nder Voigtlander Super Wide Heliar III.